100kph is the default rural speed limit and default speed limit for non-built-up areas - urban motorways (freeways/tollways), rural undivided road with sealed pavement wider than 5.6 metres, rural divided roads. Some classes of vehicle will be restricted in certain areas while other vehicles don't have that restriction. 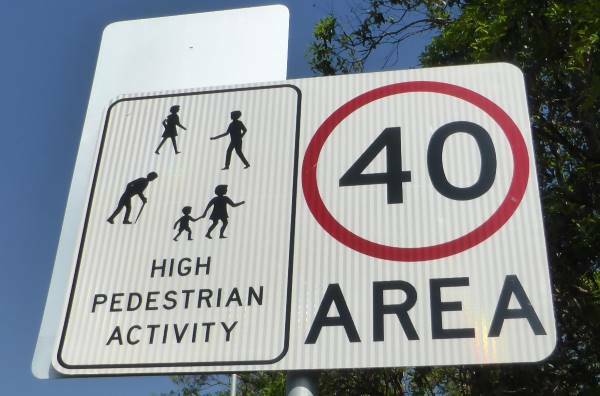 The image above shows that trucks and buses are restricted to 40kph in this zone. Cars and motorbikes are exempt from the restriction and the standard or posted speed limit for that area will apply (for example 50kph). Exceeding the speed limit by any speed is technically against the law and you can be fined even if you are doing 1kph over the limit. However, some tolerance is allowed for common sense purposes: there is some variation in speedometer accuracy, a new set of tyres will read a lower speed than a worn set because of the greater circumference, drivers of different heights have a different view of the speedo needle, and it's not beneficial to encourage drivers to be looking at their speedometer all the time as it means their eyes are diverted from the road. If you are driving sensibly for the conditions with an appropriate gap to the vehicle in front then it's unlikely you will stopped and ticketed for a coupe of kilometers per hour over the limit.